Now that the battle against osteoporosis has been won physically, mentally, emotionally, and spiritually, my main thrust is to continue to keep my bones strong by keeping my body healthy and vibrant. Good health habits must be maintained, or the victory won will have to be fought all over again. Perish the thought! 1) My optimum bone density level will not be the same for me as it is for the average-sized woman. Because I am a tiny, small-boned woman of Irish descent, my bone density will naturally be lower than the norm. 2) I must keep my blood alkalized by consuming an 80% alkaline / 20% acid diet, so that my body has no need to leach calcium from my bones to neutralize acids from my food intake. 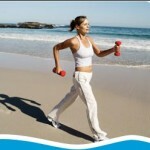 3) Daily weight bearing exercise tells my body to build strong bones for my daily activities. 4) Lots of water helps to keep the lymph vessels clear and flowing freely, so that my cells can be clean and running efficiently. 5) My body needs 7-8 hours of sleep every night to rebuild and detoxify all body systems. 6) Sincere efforts to love God and neighbor engender thoughts of peace and love and forgiveness. 7) Thoughts of peace, love, and forgiveness make life a joyful journey! May God continue to bless us as we place our hope in Him!